When you drink our wine, do you ever feel like pulling a Bruno Tonioli and screaming "TEN!" with some oddly emphatic arm movement...?! Or maybe you have no clue what that reference is (psst... Dancing With the Stars), but, you still get incredibly excited with wine-induced emotion when having a glass of Fiddlehead. Part II: So, why should everyone care about sustainability? 1. Social responsibility - We offer competitive wages, medical insurance, training, and education to our workers. 2. Water conservation - We regularly monitor soils, plants, and weather, irrigating vines only when needed. 3. Clean Water - We keep water clean by growing grasses to reduce erosion and filter storm runoff. 4. Safe Pest Management - We introduce beneficial insects, attract raptors, and plant enriching cover crops to keep vineyards healthy. 5. Energy Efficiency - We minimize tractor use to reduce our carbon footprint, and use alternative fuels and energy sources like wind and solar. 6. Habitat - We create wildlife corridors to give animals access to traditional watering holes and food, helping them maintain biodiversity. 7. Third Party Audit - We verify adherence to SIP's strict standards through third party documentation and onsite inspection. 8. Improvement - We annually update and regularly peer review the farming standards, as best management practices evolve with new science, technology and research. And it doesn't stop at our efforts in Santa Barbara County. Our source for Pinot Noir in Oregon - Alloro Vineyard - participates in a similar program: "Low Input Viticulture & Enology," or LIVE (click to read more). Like many of you, we like clean air, crisp water, and polar bears... I mean, who wouldn't? Fun fact, polar bears love Pinot, who knew?! Since we want to do our part to protect the environment (and these fuzzy, Pinot lovin' creatures) it all starts with being sustainable. 1. Fiddlestix Vineyard is honored to be SIP Certified since 2014. 2. SIP considers the the whole farm - from the environment to employees to the business sustainability in the community. 3. SIP prohibits the use of high-risk pesticides. 4. SIP requires its candidates to meet nine other criteria, not required by the USDA national organic program and the Biodynamics program, including water conservation, social responsibility and sound business practices. We greatly value our little, 100 acre slice of Pinot paradise therefore we protect the vineyard so that it can continue to produce fantastic grapes for years to come. If you want to learn more about the SIP program, visit their website. Get your bottle (or twelve!) today. Massachusetts, we've been waiting for this! Hold on to those socks of yours because we are about to knock them off! We have been waiting for this day a very, very long time! ship all of your Fiddlehead favorites straight to you. Crack open a bottle of our Bubbly because this is something to celebrate. And it gets even better... there is no sales tax applied to your wine purchase. "I need to place an order ASAP"
"YES! I can finally be part of your wine club!" "I've got a lot to discuss with you. I'll give you a call today." Vintners' Festival Weekend is April 25-26. Planning a trip out to Lompoc for the Vintners' Spring Weekend in April? Check out LompocWineryAlliance.com﻿ to find the best places to stay, play and eat. They have the suggestions on what to do while you're here, but let's be honest... what's better than wine tasting?! They'll give you the lowdown on the Ghetto so you don't miss a thing. While you're here for the festival, be sure to stop by our Cellar Celebration Open House on April 26th! We are pouring ALL the goodies including some very special reserve wines that we rarely taste - Lollapalooza, Hunnysuckle, Clonal Trio, Goosebury, and Alloro just to name a few. And the icing on the cake - we are sampling straight out of the barrel our brand new Gruner Veltliner. It is sure to be a blast and we hope you will join us! 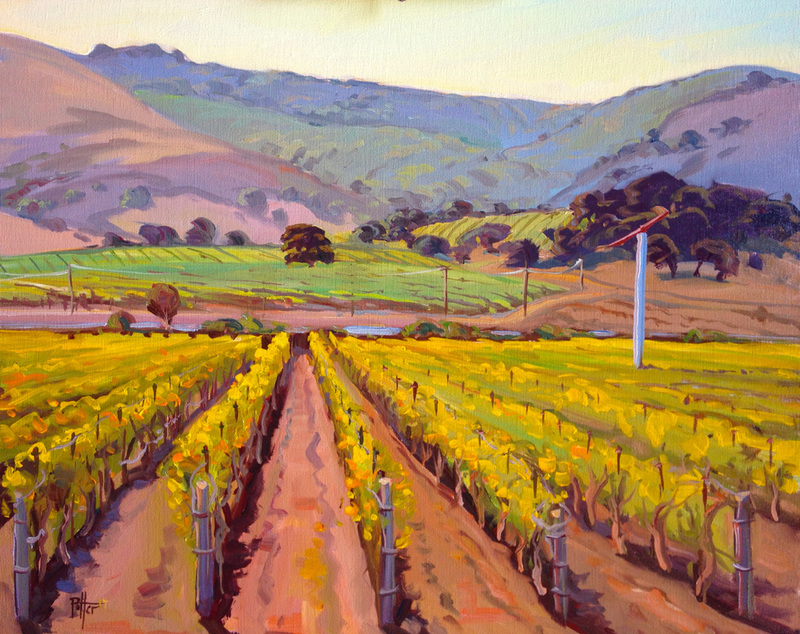 Local Santa Barbara artist, Chris Potter, recently visited Fiddlestix to paint our vineyard as part of his "postcards from Santa Barbara" - a daily plein air painting project. We were honored to be included as one of his features! "We make great wine but we don't take ourselves too seriously." However, we take our dress-up days very seriously! on Fridays we strut our stuff and show off our costume skills in our office. Flinstones, famous icons, and what I wanted to be when I grew up. And to top it off, we often pair a food theme to go with it. Here's a brief look at some of the highlights! Have a theme you want to suggest to us? Send us a quick EMAIL! Get to know the faces of Fiddlehead! Each week we will be giving our fans a glimpse inside the private lives of the members of Team Fiddlehead. Q: What is your favorite Fiddlehead wine & food pairing? A: 'Hunnysuckle' and Mary’s Free Range chicken breast (seasoned with salt and rosemary). Q: If you had a "theme song" that played whenever you walk into a room full of people, what would it be? Q: When you were 6 years old, what did you want to be when you grew up? Q: Wine excluded, what is your favorite beverage? A: Water…sometimes I even add a squeeze of lemon if I’m feeling spunky. Q: Which do you prefer, chunky or smooth peanut butter? A: Umm… peanut butter isn’t paleo, so neither. Q: What is a simple fact that people would be surprised to learn about you? A: I’m a twin but my other half is 3/4th robot.